This is a simple INI editing tool of Skyrim. 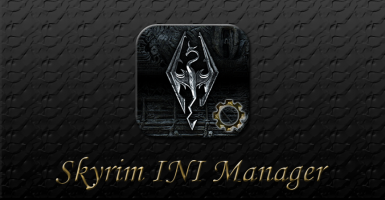 There is a need to fine-tune the INI because only setting of Skyrim launcher is not sufficient in order to play comfortably Skyrim. Support ENB environment setting (v0.319) and CrashFixes (v12). You can build a more stably environment! To edit the INI every time have to find of edit item and if you enter an incorrect value, worst there is a risk will not start the game. Main functions is sufficient for this one, and it is possible to edit safely and easily by the GUI in this tool. If you finished the only setting of "Skyrim Launcher," can expect a significant performance up! and You will be freed from trouble task!! 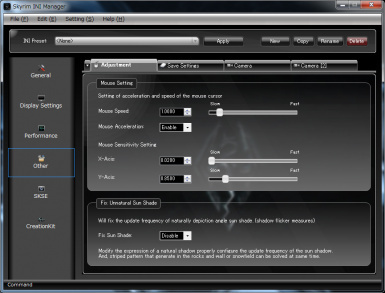 This tool have display settings, SKSE(plugin) setting, ENB setting, CreationKit setting, direct editing of INI, backup and restore function, the preset function. 1.To edit the item (drop-down or text box) you want to edit. 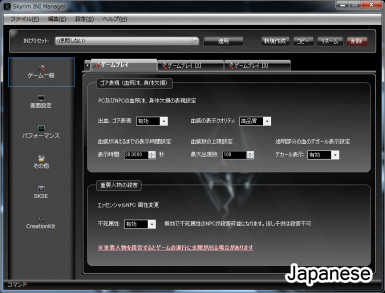 2.Save the setting "File" → "Save Setting" and check starting the game. 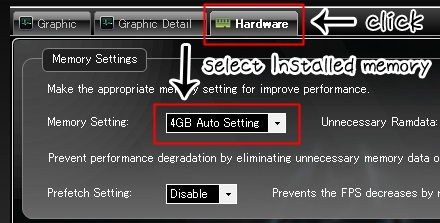 If you want to return to the setting before saving, press "File" → "Reload Setting". If you want to return to the default setting of Skyrim. 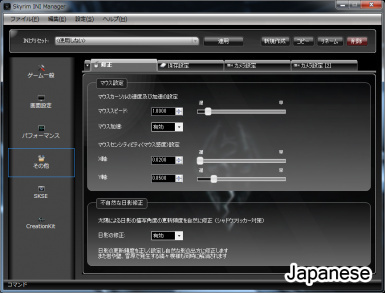 "Edit" → "Change Skyrim default settings" and Save the setting. If you want take the Backup of INI. backup has been create in the directory "backup" of this tool. If you want restore the Backup of INI. 2.select backup list and press Restore button. Unnecessary backups can be remove by pressing the Delete button. Press the NEW button to create a preset and enter the preset name. 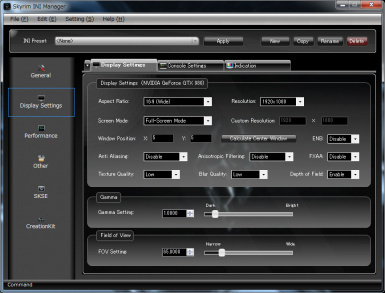 The current settings will be copied to the new preset. change the preset, select a preset from the listbox in the INI preset and press Apply button. if you want to delete presets, select preset in the listbox and press the Delete Button. Please press the Apply button to select the "None" a preset in the listbox if you do not want to use the preset. Next, create new folder and move "Skyrim.ini" and "SkyrimPrefs.ini" into this new folder. If you have following INIs. Please put into preset folder. It is possible to performance up easily in the following ways. 1. Click Graphic in Performance tab. 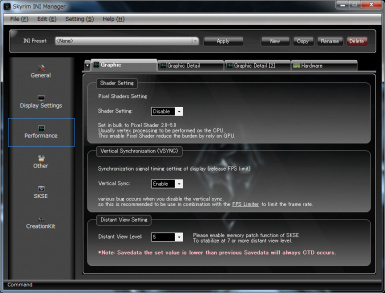 and set enable Shader Setting. 2. Click Hardware tab and select your installed memory. 3. Set enable to Multithread. and, set to number of Multicore for increase the processing power. 4. If you installed SKSE plugin, click SKSE tab and enable Memory Patch. Next select extend memory 768 or 1024. If the game is CTD on startup, please lower than the current memory value. 5. If you installed ENB, click graphics on the ENB tab and disable Vsync. 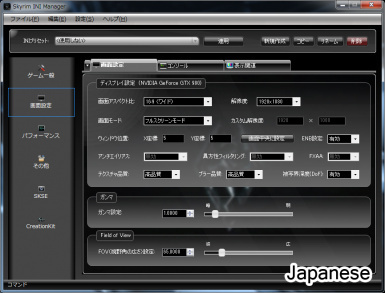 At this time, check whether the FPS limit is enable and the FPS limit value is within 60 to 100. 6. Click Performance tab, check the ExpandSystemMemoryX64 is disable and ENBoost is enabled. 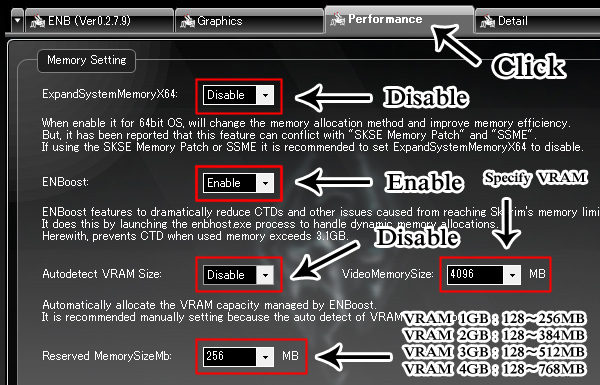 Disable the Autoditect VRAM size, and specify the VideoMemorySize for graphic board capacity. Specify the Reserved MemorySize in the following example. 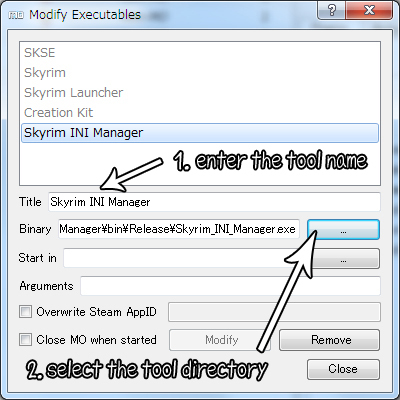 Simply launch this tool "Skyrim_INI_Manager.exe" from the folder where you unzipped. 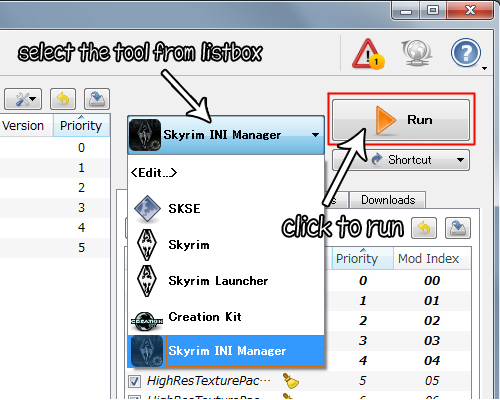 If the ini files of Program Files Creation kit and ENB can not be saved on Windows Vista or later OS, please use UAC version "Skyrim INI Manager(UAC) .exe". If you want to uninstall, please delete direct this program. Please Register for this program to Mod Organizer. and start this program from the MO. 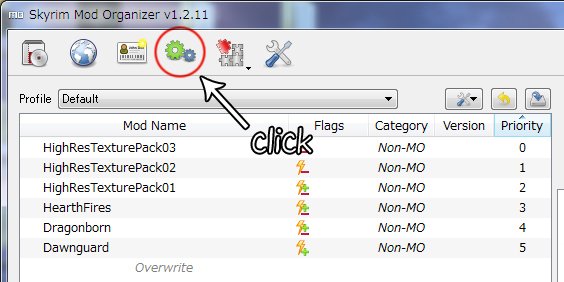 How to start and registration from Mod Organizer. 1. Click to open Modify Executables window. 2. Enter the title of the tool name and specify the directory of the tool. 3. Select the tool from listbox and Run button. If you can not register the program to the MO, You can change the INI path form option menu of tool. and, Please run as administrator this program. Q. I installed Skyrim, but tool dialog appears "Skyrim has not installed" when startup. A. This tool is check the Skyrim Install path of registry when startup. If cannot launch tool, try launch the Skyrim Launcher. If you still can not launch, Please check the "Installed Path" of registry. "Installed Path" key if not found, Please create a registry key. Q. This tool will be detected virus by Norton. Is this tool a virus!? A. Please don't worry,this is not a virus. this tool is compiled with x86 for MO, but If compiled with x86 only will be false detection by Norton. If you are still concerned, please conduct a survey request to Symantec. Q. Do you support other language translation? A. Sorry, I have no environment and time to support the other language. -Fix does not work default setting of high refresh rate and gravity setting. - Add Game Play tab and gravity settings in General tab. - Modified some of the topics. - Fine-Tune of the program other. - Unlock VRAM 4GB upper limit function for Windows10. - Change description for Borderless Fullscreen. - Optimize upper limit of camera setting. - Support 4K (3840 x 2160) for screen resolution setting. - Fix bug that ENB FPSLimit was not saved in LIMITE section. - Fix bug that enblocal.ini was not released even if it was read-only. 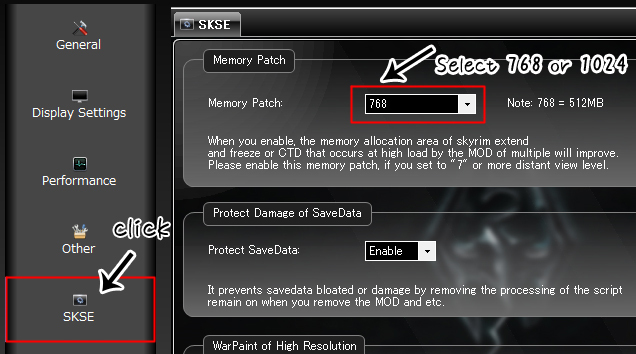 - Add function to automatically disable ENB Memory Hack function when ExpandSystemMemoryX64 is enabled. - Improve tips topics and message box descriptions. 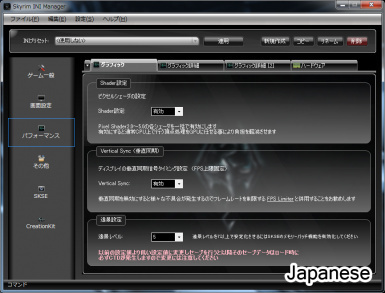 - Add reloading of settings to FileMenu. 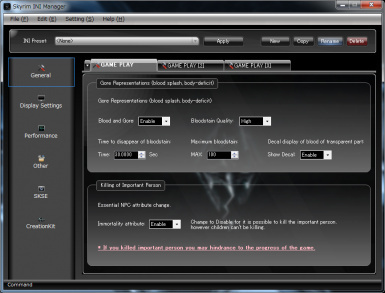 - Add multiple killMove setting and KillMoove end time setting in General tab. - Add CrashFixes (v12) setting in SESE plugin tab. - Add ENB environment(enblocal.ini) setting to main tab. - Add a warning message when the distant view level is set to 7 or higher. - Updated value table (default setting) to Skyrim final version (v1.9.32) (Refer to: S.T.E.P. Project Wiki). - Improve Papyrus script value and add medium setting to priority setting. - Improve preset apply message.If selected preset contains a setting file other than Skyrim, you can check the preset contents. - Change to not save to INI if it is set to default value except for exist keys in Skyrim initial INI. - Fix exception error (Null) on startup, if incorrect numeric value was entered in screen AspectRatio of INI. - Fix bug that MAP zoom limit setting (valid / invalid) was reversed and saved. - Fix minor bug and fine tune of the program other. -Change to display a warning message, if you specify "1024" in SKSE memory patch function. -Change the setting name from "Backup Count of AutoSave" to "Backup Count of QuickSave"
-Full support of the high DPI environment. - Fix setting SKSE memory patch of "1024"